Along with the global economic recovery and strong market upturn, the Economic Daily News will organize “ Int'l Building Materials and Furniture Exhibition, Taipei” in mid-November 2017, The purposes include recommendation of various quality building materials and service for domestic quality building-materials and realty clients, thereby functioning as a platform of exchanges between domestic and foreign industries and helping exhibitors obtain good results from the show. ●Utilize the entire A、D areas of Exhibition Hall 1, Taipei World Trade Center, making it the largest Int'l Building Materials and Furniture Exhibition in Taiwan. ●Separation of distinct exhibition areas augments exhibition effect. ●The exhibition period is the season for year-end procurement by people, search for new building materials by interior designers and architects, and house purchase. ●Participation of government units and related industrial associations further enhances the effect. ●Professional seminars: In cooperation with industrial associations, organize a series of professional seminars on building materials and green buildings, to enrich the contents of the show. ●Lectures by renowned experts: Organize lectures on realty and wealth management. ●Participation of the Construction and Planning Agency the Ministry of the Interior and Architecture and Building Research Institute, the Ministry of the Interior, assures quality of exhibitors. ●Strict screening of exhibitors’ qualifications, rigorous separation of distinct exhibition areas, most efficient procurement, and highest protection. ●The organizer, Economic Daily News, boasts abundant experience in organizing large-scale exhibitions, assuring exhibition effect. ●Free basic partition assures optimal exhibition quality, free quota for utility service, and arrangement of contracted service providers. ●Admission for visits of families with children, effectively attracting visiting crowd. The organizer will arrange advertisements and news reports on the publications of the United Daily News Group, including United Daily News, Economic Daily News, United Evening News, MRT paper Upaper, website of Economic Daily News, as well as sending extensively e-paper and invitation letters to related businesses, buyers, industry associations, government agencies, schools, and procurement units, so as to attract more visiting crowd and augment exhibition effect. During the exhibition period, the Economic Daily News will publish exhibition preview with large space, and the organizer will also arrange advertisement in TV, related professional magazines, business magazines, and radio broadcast, as well as large-scale outdoor advertisement, to extensively invite businesses and consumers to visit the exhibition. It will also erect roadside banners to intensify the promotion and augment the exposure of the exhibition. The organizer will provide free invitation cards for use by exhibitors to invite businesses and consumers to visit the exhibition, and will send mails to professionals, such as engineers in science parks, professional designers, architects, doctors, teachers, lawyers, and association members, inviting them to visit the exhibition. 1. Exhibitors can get one free booth unit for renting five units or two free units for renting eight units. 2. Recipients of free booth units, though, will not be entitled to free basic partition and free utility usage. 1. Registrations for participation are accepted immediately, and will be stopped when all booths are booked. The charge per booth is NT$38,850, including NT$37,000 for promotional and miscellaneous expenses and NT$1,850 for business tax. The deposit （NT$10,000 per booth） will be charged once the booths are registered. The payment is to be covered by a check payable to the United Daily News Co., Ltd., post-dated no later than Oct. 23, 2017. 2. Those intending to take part in the exhibition should fill out the registration forms and application forms for water- and electricity-supply engineering, which should be presented to the organizer upon registration. 3. If registered companies notify the organizer of their inability to take part in the exhibition before the holding of the coordination meeting, they will be not able to take back their NT$10,000 deposits but the remainder will be returned to them without interest. If they cancel their participation after the coordination meeting, the organizer will only return to them half of their payment, without interest. 1. Those which complete the registration procedure by delivering the registration form and paying the exhibition fee three days ahead of the coordination meeting can attend the meeting. 2. Priority of exhibitors in choosing booths will be set according to the time for the completion of their registration procedures. 3. The organizer will notify via mail exhibitors concerning the time and venue for the holding of the coordination meeting. 1. Exhibitors should not transfer, lease, or merge their booths in private, or display unregistered exhibits under company names different from the registered ones. 2. Exhibitors should be fully liable to compensation for improper booth decoration, which inflicts damages on showground facilities or exhibits of neighboring exhibitors. 3. Products irrelevant to the exhibition theme shouldn’t be allowed to take part in the exhibition. Exhibitors should bear legal responsibilities themselves for counterfeit products. 4. In case the organizer has to defer or shorten the exhibition period due to force majeure, including act of God, plague, strike, or national emergency, it’ll not be liable to any responsibility for compensation. 5. For any insufficiency in the regulations, the organizer will make necessary revisions or additions and explain the changes to exhibitors. 1. The showground will be open to the exhibitors for booth decoration on November 15 and 16, 2017. 3. The organizer will not provide service or space for the temporary storage of objects. Exhibitors should clear non-exhibits and large wastes （such as wooden box） out of the showground. 1. The exhibition will be formally inaugurated with a ribbon-cutting ceremony on the morning of November 17, 2017 and will last until Nov. 20 10:00 a.m. to 6:00 p.m. every day. The exhibition will open to all visitors free of charge. （Children under age of 12 will be denied access to the showground on November 17 and 20 but will be allowed to visit the exhibition on November 18 and 19）. 1. Dismantling and clearance should be undertaken 6:00 p.m.-00:00 a.m., after the closure of the exhibition on November 20, 2017. Afterwards, the organizer will assume responsibility in regard to waste disposal, with related fees to be borne by the exhibitors. 2. After the end of the exhibition, exhibitors must require their contractors to remove all of their own objects used to decorate their booths, including carpets. Companies with exhibits complying with the nature of the exhibition are welcome to attend the exhibition, including manufacturers, agents, exporters, importers, consulting firms, service businesses, academic research units, and technical service firms. 1. Focus on exhibition of physical products, supplemented with media display such as catalogues, film, projection slides, or TV wall. 2. Voice volume of stereo equipment utilized by exhibitors shouldn’t exceed 70 decibels, according to the regulation of the Taipei World Trade Center exhibition hall. (1) Three projector lamps and a 80% new carpet. (2) One set of nameplate bearing the exhibitor’s company name in full. 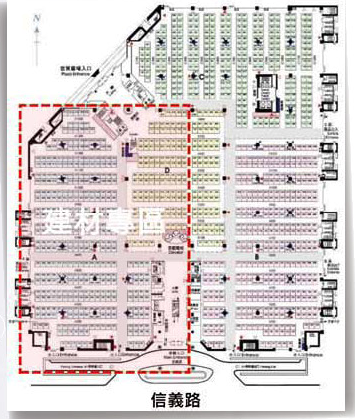 (3) One reception table and two chairs for every exhibitor. © Economic Daily News. All Rights Reserved.